In bars across the country during late afternoons and early evenings, folks are soaking up their Happy Hour drinks with appetizer-sized burgers advertised as “sliders.” Given how the term has taken on a more general meaning, they may have no idea that it traces back to a specific brand of hamburgers sold by White Castle restaurants. The White Castle hamburger is a little square burger with a steamed bun, tiny bits of chopped onion, and a thin beef patty with holes in it to make for faster cooking. White Castles sold at their restaurants include a small dill pickle slice; the frozen ones do not. White Castles cannot be found everywhere; in fact, I wish they would open one here in Boston! According to Wikipedia, the company has opened some 420 restaurants, concentrated in the Midwest, South, and the New York metro area. They also are sold frozen, six to a box, in various grocery and convenience stores. I bought the box pictured above at the Walgreen’s in downtown Boston. Though it may seem like pure gluttony to consume the entire box for one meal, in reality it’s not that much. A box of six burgers comes out to less than 600 calories, in fact. Add something to drink and you’re good to go! And speaking of go, that’s sort of how White Castle burgers got tagged as “sliders,” in that eating a bag full of the little guys with chopped onions and all had, well, predictable combustible effects, especially if onion rings and fries were added to the mix. 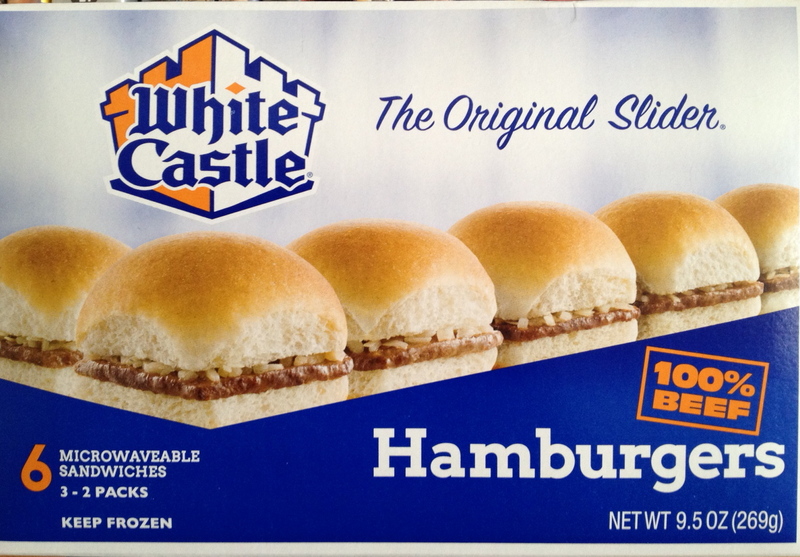 I recall reading something years back, reporting that the White Castle company once vehemently resisted the slider designation. Obviously they’ve relented and embraced it.